DRESDEN, Germany, March 28 (Yonhap) -- Following is the full text of South Korean President Park Geun-hye's speech in the former East German city of Dresden on Friday. The address was titled, "An Initiative for Peaceful Unification on the Korean Peninsula. Dresden - beyond division, toward integration." Professor Hans Mueller-Steinhagen, former Prime Minister Lothar de Maiziere, students and faculty members of the Dresden University of Technology, ladies and gentlemen. It is my great pleasure to visit this esteemed German institute of higher learning. It is also a unique privilege to receive an honorary doctorate from a university where the presence of history and tradition can be felt. As the fastest-growing region in former East Germany, Dresden is an iconic community that has moved beyond division and toward integration. The German people have transformed Dresden into a city brimming with hope - where freedom and abundance suffuse the air. Those who reach beyond the confines of reality and dream of a better world can draw strength and inspiration from this city. As I ponder on where a united Germany stands today and where the Korean Peninsula seems headed next year -- namely 70 years of division -- I find myself overwhelmed by the sheer weight of history. We have a saying in Korea that the impact of education lasts for generations and beyond. Looking around your campus today, I am reminded of how a nation's future is often charted and shaped from the likes of Dresden University of Technology. The words 'Knowledge builds bridges, education binds people' represent the educational vision of this university. And I am sure it is a vision that will be lived out through the passionate strivings of its students and faculty alike, and will help usher in a brighter future. As one who studied electronic engineering in college, I hold dear the belief that science and technology are the key to unlocking a nation's advancement. This is why I established the Ministry of Science, ICT and Future Planning early in my presidency and have been highlighting the importance of building a creative economy. Ours is an era when the ingenuity and innovation of a single individual can move the world. As we enter this new age, I am seeking to generate new business opportunities and jobs through creative endeavors and innovation; to breathe greater vitality and dynamism into the economy by marrying science and technology and ICT to existing industries. This is what a creative economy is all about. We will also strengthen collaboration among academia, industry and local communities -- very much like what the City of Dresden has been doing -- and provide the kind of support that enables a creative economy to spur local renewal and development. I believe that in our efforts to make Korea's economy more creative, we will continue to find much to draw upon from the future evolution of Dresden and its colleges. Korea and Germany have long been bound by special links. Fifty years ago, Korea was among the poorest nations in the world, with a per capita income of 87 dollars. Many young Koreans fresh out of college came here to Germany to earn money. They came as miners and nurses and dedicated themselves to working in the service of their homeland. As much as Korea sought to lift its economy out of poverty, no country was willing to offer loans to a small nation in the northeast corner of Asia, let alone to a divided one. It was in those difficult and forlorn times that Germany stepped up and provided 150 million German Marks in loans, while also offering advanced technology and vocational training programs. Germany's help would prove to be a huge boost to Korea's subsequent modernization and economic development. The Korean president who visited Germany at the time felt that Germany's rise from the ashes of the Second World War and its Miracle on the Rhine were feats that could be replicated in Korea. As he was driven on the autobahn and shown the steel mills of German industry, he became convinced that Korea too would need its own autobahn and its own steel industry to effect an economic take-off. When that president sought to build expressways and steel mills upon his return to Korea, he was met with widespread resistance. "What use is an expressway when we don't have cars? Building an expressway is a recipe for failure.” “What’s the point of a steel mill when we’re struggling just to get by?”- went the argument. But the highways that were eventually paved against such opposition became the solid bedrock on which the Korean economy would rise. Those long stretches of concrete helped remove bottlenecks in the nation’s distribution and logistical networks. The steel and automobile industries which had thus begun, join the ranks of the top five, six players in the world today. The desperate country that 50 years ago had been hard-pressed even to obtain loans, has now come of age as the 8th largest trading nation in the world and a major economic partner to Germany. As President of grateful nation, I thank Germany once again for placing its confidence and trust in the Republic of Korea, helping us pull through those difficult years. Germans and Koreans get going when the going gets tough. In the years following the Second World War, Germany and Korea both endured the pain of seeing their nation divided. But instead of submitting to despair, Germans and Koreans alike marched forward with hope. From lands ravaged by war, Germans and Koreans worked as hard as any to rebuild. They refused to let up their determination to pass on a better country to future generations. Thus came the Miracle on the Rhine and the Miracle on the Han River some years later. Germany would later go on to achieve unification, but Korea has yet to become whole again. I believe that just as the Miracle on the Rhine was followed by the Miracle on the Han, so too, will unification in Germany be reenacted on the Korean Peninsula. I remember the bold courage of the German people as unification and integration unfolded. Even the Berlin Wall, which had seemed so insuperable, couldn’t stop the longing for freedom and peace coming from both sides of the Wall. Years of preparation by the people of East and West Germany eventually succeeded in turning the great dream of unification into reality and, ultimately, even transformed the future of Europe. A reunited Germany took its place at the heart of Europe. The years since unification have seen Dresden emerge from a backwater into a world-class city known for its advanced science and technology. Other parts of the former East Germany also made huge strides forward. These are the images of one Germany that encourage those of us in Korea to cement our hope and our conviction that unification must also come on the Korean Peninsula. I believe that the Republic of Korea will similarly reach ever greater heights after unification. The northern half of the Korean Peninsula will also experience rapid development. A unified Korea that is free from the fear of war and nuclear weapons will be well positioned to make larger contributions to dealing with a wide range of global issues like international peace-keeping, nuclear non-proliferation, environment and energy, and development. Furthermore, as a new distribution hub linking the Pacific and Eurasia, it is bound to benefit the economies of East Asia and the rest of the world. It pained me to see a recent footage of North Korean boys and girls in the foreign media. Children who lost their parents in the midst of economic distress were left neglected out in the cold, struggling from hunger. Even as we speak, there are North Koreans who are risking their lives to cross the border in search of freedom and happiness. The agony inflicted by division is also captured by the plight of countless people who were separated from their families during the war and who have ever since been yearning to see their loved ones without even knowing whether they were still alive. Just as the German people secured freedom, prosperity and peace by tearing down the Berlin Wall, we too, must tear down barriers in our march toward a new future on the Korean Peninsula. Today, a ‘wall of military confrontation’ runs through the center of the Peninsula. A ‘wall of distrust’ has also been erected during the war and the ensuing decades of hostility. Formidable still is a ‘socio-cultural wall’ that divides southerners and northeners who have long lived under vastly different ideologies and systems in terms of how they think and live. Then there is a ‘wall of isolation’imposed by North Korea’s nuclear program, cutting North Korea off from the community of nations. All of these curtains must be swept away if we are to unite the Korean Peninsula. And in their place we must build a‘new kind of Korean Peninsula:’a peninsula free of nuclear weapons, free from the fear of war, and free to enjoy life, peace and prosperity. I harbor no illusions that these tremendous barriers could be torn down with ease. But the future belongs to those who believe in their dreams and act on them. To make today’s dream of peaceful unification tomorrow’s reality, we must begin meticulous preparations now. Nor do I believe that a nation is made whole again simply by virtue of a reconnected territory or the institution of a single system. It is when those in the south and the north can understand each other and can get along as people of the same nation, that the Korean Peninsula can truly experience renewal as one. In my view, Germany was able to overcome the after-shocks of unification fairly quickly and achieve the level of integration we see today because of the sustained people-to-people interaction that took place prior to unification. Now more than ever, South and North Korea must broaden their exchange and cooperation. What we need is not one-off or promotional events, but the kind of interaction and cooperation that enables ordinary South Koreans and North Koreans to recover a sense of common identity as they help each other out. And so I hereby present three proposals to North Korean authorities in the hope of laying the groundwork for peaceful unification. First, we must take up the agenda for humanity -- the concerns of everyday people. For a start, we must help ease the agony of separated families. It makes little sense to talk about solidarity as one nation, when members of the same family are refused their god-given right to live together. It has been 70 long years. Last year alone, some three thousand eight hundred people who have yearned a lifetime just to be able to hold their sons’ and daughters’ hands -- just to know whether they’re alive - passed away with their unfulfilled dreams. I am sure the same is true of their fellow family members in North Korea. Allowing reunions should also give family members in North Korea solace. In order to address problems arising from family separations, East and West Germany permitted family visits in both directions and steadily promoted exchanges. It is about time South and North Korea allow family reunions to take place regularly so we could ease their anguish and build trust in doing so. We will reach out to North Korea to discuss concrete ways to achieve this and engage in necessary consultations with international bodies like the International Committee of the Red Cross. Going forward, the Republic of Korea will expand humanitarian assistance to ordinary North Koreans. The Korean Government will work with the United Nations to implement a program to provide health care support for pregnant mothers and infants in North Korea through their first 1,000 days. Furthermore, we will provide assistance for North Korean children so they could grow up to become healthy partners in our journey toward a unified future. Second, we must pursue together an agenda for co-prosperity through the building of infrastructure that support the livelihood of people. South and North Korea should collaborate to set up multi-farming complexes that support agriculture, livestock and forestry in areas in the north suffering from backward production and deforestation. Working together from sowing to harvesting will enable South and North Korea not just to share the fruits of our labor, but also our hearts. As the bonds of trust begin to burgeon between the two sides, we can start to look at larger forms of development cooperation. To help make life less uncomfortable for ordinary North Koreans, Korea could invest in infrastructure-building projects where possible, such as in transportation and telecommunication. Should North Korea allow South Korea to develop its natural resources, the benefits would accrue to both halves of the peninsula. This would organically combine South Korean capital and technology with North Korean resources and labor and redound to the eventual formation of an economic community on the Korean Peninsula. 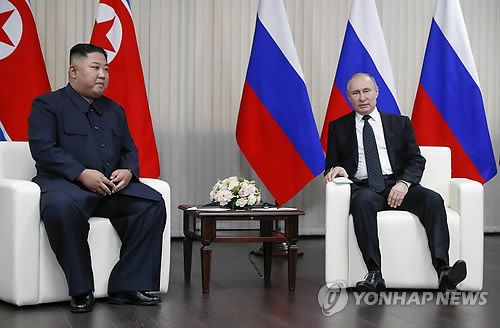 In tandem with trilateral projects among the two Koreas and Russia, including the Rajin-Khasan joint project currently in the works, we will push forward collaborative projects involving both Koreas and China centered on the North Korean city of Shinuiju, among others. hese will help promote shared development on the Korean Peninsula and in Northeast Asia. The international community also needs to take greater interest in getting involved if development projects in North Korea are to proceed more efficiently. I call on those NGOs from Germany and Europe which have extensive experience working with North Korea on agricultural projects and forestry to join us. I also hereby ask international organizations like the United Nations and the World Bank for their support and cooperation. Third, we must advance an agenda for integration between the people of South and North Korea. As the state of division persists year after year, the language, culture and living habits of the two sides continue to diverge. If there is to be real connection and integration between the south and the north, we must narrow the distance between our values and our thinking. To achieve this, those from the south and the north must be afforded the chance to interact routinely. We will encourage exchanges in historical research and preservation, culture and the arts, and sports -- all of which could promote genuine people-to-people contact - rather than seek politically-motivated projects or promotional events. Should North Korea so desire, we would be happy to partner with the international community to share our experience in economic management and developing special economic zones, and to provide systematic education and training opportunities relating to finance, tax administration and statistics. We could also look at jointly developing educational programs to teach future generations and cultivate talent, for it is in them that the long-term engines to propel a unified Korean Peninsula forward will be found. I hereby propose to North Korea that we jointly establish an ‘inter-Korean exchange and cooperation office’ that would be tasked to realize these ideas. The armistice line bisecting the peninsula and the demilitarized zone, which is in fact the most militarized stretch of real estate on the planet, best epitomize the reality of our division today. My hope is to see South and North Korea, together with the United nations, moving to build an international peace park inside the DMZ. By clearing barbed-wire fences and mines from parcels of the DMZ, we can start to create a zone of life and peace. This international peace park will presage the replacement of tension with peace on the DMZ, division with unification, and conflict in Northeast Asia with harmony. If South and North Korea could shift the adversarial paradigm that exists today, build a railway that runs through the DMZ and connect Asia and Europe, we will see the makings of a genuine 21st century silk road across Eurasia and be able to prosper together. North Korea must choose the path to denuclearization so we could embark without delay on the work that needs to be done for a unified Korean Peninsula. I hope North Korea abandons its nuclear aspirations and returns to the Six Party Talks with a sincere willingness to resolve the nuclear issue so it could look after its own people. Should North Korea make the strategic decision to forgo its nuclear program, South Korea would correspondingly be the first to offer its active support, including for its much needed membership in international financial institutions and attracting international investments. If deemed necessary, we can seek to create a Northeast Asia Development Bank with regional neighbors to spur economic development in North Korea and in surrounding areas. We could also build on the Northeast Asia Peace and Cooperation Initiative to address North Korea’s security concerns through a multilateral peace and security system in Northeast Asia. Here lies the road to shared prosperity between South and North Korea and here lies the path to peace and prosperity in Northeast Asia. Korea will aspire to a unification that promotes harmony with its neighbors, that is embraced by the community of nations, and that serves the cause of the international community. With a view to ushering in an era peaceful unification on the Korean Peninsula, I will soon be launching a committee to prepare for unification -- one that reports directly to me as president. People from inside and outside the government will come together through this committee to muster our collective wisdom as we more fully prepare for the process of unification and integration. Human history has been an incessant march towards justice and towards peace. Just as Germany turned the great wheels of history forward from the western end of Eurasia, a new chapter in mankind’s progress will start from its eastern tip, namely the Korean Peninsula. Just as German unification represented the inexorable tide of history, I believe that Korean unification is a matter of historical inevitability. For nothing can repress the human yearning for dignity, freedom and prosperity. Today I stand behind this podium and observe the faces of young German students bound together by an impassioned quest for truth. And as I do so, I am also picturing the day when young students from both halves of a unified Korean Peninsula are studying side by side and nurturing their dreams together. Mark my words -- that day will come. And when that day arrives, young people from Germany, from the whole of Korea and from all over the world, will exchange their vision of a better world as they travel back and forth between Asia and Europe through a Eurasian railway. I ask our friends here in Germany to join us on this journey to peaceful unification. ‘Wir sind ein Volk!’ The day will soon come when these powerful words that united the people of East and West Germany echoes across the Korean Peninsula. In closing, may a prosperous future await our true friends here in Germany and here at the Dresden University of Technology. Thank you.